Reflexology in Frome, Somerset, Bath and North East Somerset, Bradford-on-Avon, Wiltshire. Reiki training in Frome, Somerset, near Bath and Dorset and Wiltshire borders. Reflexology is an ancient healing therapy dating back to ancient Egypt. It has also been practised in other cultures, for instance the Chinese and the Native Americans. Current practice incorporates more recent scientific knowledge and research, and it is increasingly respected by the medical profession. Some GPs in Britain now refer people for reflexology and some hospitals use it in palliative care and to help post-operative recovery. Our feet have over 7,000 nerve endings which connect to the rest of the body, as well as ‘reflex’ points which correspond to various parts of the anatomy. The feet in effect represent a map of the complete body. Skilled pressure of the reflex points and different areas on the feet can help to relieve physical symptoms and stimulate the effective functioning of organs, joints and vital body systems. It is also possible to practise reflexology on the hands if for some reason the feet are not accessible: for example in the case of some hospitalised patients, amputees and people with serious foot problems. Reflexologists are trained to detect tension and imbalances in the feet which correspond to a particular part of the body. 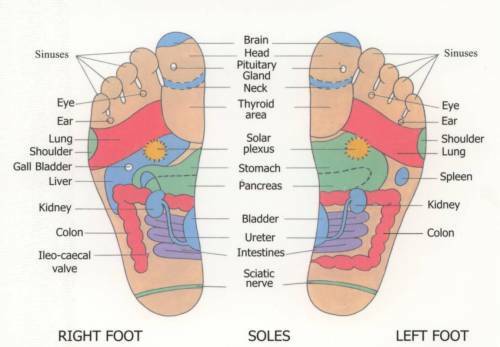 While reflexology does not claim to cure or diagnose, these findings may offer a very useful insight into our body's functions and dysfunctions, including any tensions in the related chakras (main energy centres in the body). Often there are very simple ways to address these imbalances once we are aware of them. Regular reflexology is believed to give a boost to all the body's systems and may therefore be a very useful preventive treatment. As a general rule, if you are well then reflexology can help you stay healthy; if you are unwell, it can help you recover and maintain your health! Click here to discover how reflexology could help you. During a reflexology treatment, the client lies fully clothed (except for socks) on a comfortable couch or recliner, while the reflexologist gently presses and manipulates different parts of the feet. It is usually deeply relaxing and some clients even fall asleep! Afterwards the client is given a glass of water and they can discuss any imbalances or significant areas identified during the treatment. To help the treatment flow smoothly it is best to use healthy natural organic lotions. I recommend products by Neal's Yard Remedies. You can buy these lotions and other Neal's Yard products from me if you wish, either personally or online at my NYR Organic website. Is there any reason why I shouldn't have reflexology? There are very few contra-indications for reflexology, since it is a gentle and non-invasive treatment. The reflexologist will take a full case history at your first meeting and advise you if there is any problem. You should not be treated if you have a fever or contagious illness. Clients who are pregnant, who have had thrombosis or deep vein problems, recent surgery, recent accidents or any major illness should always inform their reflexologist. The first three months of pregnancy is a time for caution, particularly if the client has a history of unstable pregnancies, since reflexology can help balance hormone function. Later in pregnancy reflexology can be very beneficial. For treatments in the Frome area I recommend Kyla Treanor on 01373 462098. More information on reflexology treatments and training is available from the Association of Reflexologists.